Hollywood Hills Suites Receives 2013 Los Angeles Award! 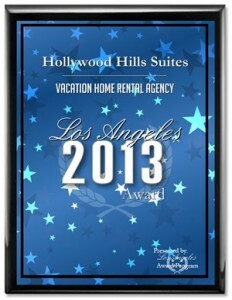 LOS ANGELES December 3, 2013 — Hollywood Hills Suites has been selected for the 2013 Los Angeles Award in the Vacation Home Rental Agency category by the Los Angeles Award Program. In honor of LA being named one of this year’s top summer U.S. destinations, “Feature Friday” is heading to Hollywood-one of LA tourists’ favorite hotspots. This week, Hollywood Hills Suites takes center stage as an awesome and affordable accommodation, perfect for a Hollywood vacation. To read more go to the article link ‘Feature Friday’: Hollywood Hills Suites, a cozy ‘home’ for a Hollywood vacation.